So sang a group of Wigan Athletic supporters. It certainly took the wind out of the sails of the “going down” taunts of home fans at the Madejski Stadium last Saturday. Shrewsbury is certainly a pleasant place to visit. Its football team has competed in each of the three EFL divisions. Their New Meadow stadium holds 9,375. Shrewsbury Town met Manchester United in the FA Cup in February 2016. They lost 3-0, which is not surprising given the fact that the Shrews had a wage bill of £2.5 m compared with £210 m of United. In fact the Shrewsbury wage bill is typical of many clubs in League 1. According to an interesting article on the Daily Mail site, the average salary of a League 1 footballer in 2014-15 was £69,500. It compared with £324,200 in the Championship. The ratio of the average salaries is 1 to 4.7. 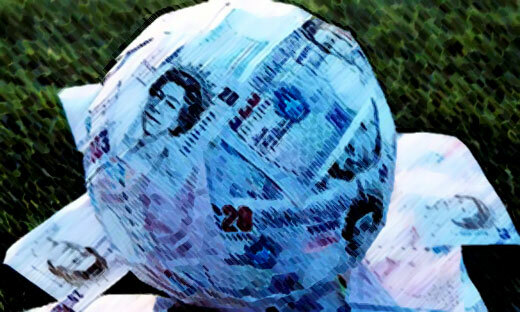 There are strong arguments to suggest that the league positions of clubs in the Championship division correlate to their wage bills. In their first season back in the Championship Wigan Athletic finished in a playoff place. The wage bill was around £30 m. Clubs in mid-table would typically have wage bills averaging £20 m.
Latics’ reputed wage bill for the current season is around £17 m. Assuming they were to trim next year’s wage bill according to, say, that previous ratio of average salaries between the two divisions, it would give a figure of around £3.6 m. In 2015-16, still buoyed by parachute payments, Latics had a wage bill of around £6 m in League 1, reportedly second highest after that of Sheffield United. So at what level will David Sharpe pitch the wage bill for the coming season? As in the Championship there is some degree of correlation between wage bills and success on the playing field in League 1. If the club is to break even financially next season what kind of wage bill would be realistic? Moreover will the club be able to slash its wage bill as successfully as it did in the summer of 2015, when faced with a drop down to the third tier? In 2015-16 Latics finished top of League 1 with an average attendance of 9,467. Shrewsbury Town finished in 14th place with an average of 5,407. The average attendance for the division was 7,163. Wigan’s cheapest adult season ticket cost £250 while Shrewsbury’s was £285. David Sharpe took a bold step in reducing season ticket prices for the club’s return to the Championship. Renewals were pitched at £179, with a price of £199 for new purchasers. The levels were uneconomic compared with those of competitor clubs, but Sharpe was clearly hoping to not only hold on to the core support, but to attract others. With just one match to go in the Championship season Wigan’s average home attendance is 11,560 up by more than 2,000 from the previous season in League 1. However, the bigger clubs in the Championship have brought sizeably larger away support than had those in League 1. Rumour suggests that the club will maintain the levels of season tickets prices for the coming season. If this is so the £179 price would be almost 40% less than the figure of £295 to be offered by Shrewsbury Town for the coming season. Moreover should Latics not be as successful as they were last time in League 1 attendances will surely fall. The match day revenue differentials between Wigan and Shrewsbury could merge closer. Put simply potential match revenues for Wigan Athletic will in no way suffice to give them a competitive advantage over most of their rivals. Some would say that under Gary Caldwell Latics had bought their way out of League 1, having a wage bill twice that of most of their rivals. That was made possible by the parachute payments they were receiving at the time. However, now that the parachute era has come to an end, how can Latics get a financial advantage over most of their competitors in League 1? One solution is to sell off assets. The second is for the ownership to provide the necessary funding. The saleable assets Latics have are their players. The club’s main asset, Yanic Wildschut, was sold in January for a hefty premium. Early in the season Will Grigg would have been another major asset: he was scoring goals and looking comfortable in the higher division. It was sad to see how the player later found himself either warming the bench, playing as a lone centre forward with a derisory lack of support, or being played out of position. A player who could have probably drawn a transfer fee in excess of £5 m is now not such an attraction on the transfer market. Better to keep Grigg who has a superb record of goalscoring in League 1. Nick Powell will surely be on his way. After months out through injury he roared back with spectacular performances as a super sub. In doing so, Powell put himself in the shop window. Dan Burn is another player who has caught the eye and will surely be of interest to Championship clubs. Burn was already an experienced Championship level player when arriving on a free transfer from Fulham. He has since developed a level of self-confidence previously lacking. Between the two, Latics could possibly raise around £5 m on the market. Omar Bogle was the most exciting of the January signings. Having scored a lot of goals for Grimsby he arrived brimming with confidence and style. But after a promising start Bogle was to wilt under a horrible burden put on him by Joyce: that of being the lone striker in a 4-5-1 formation. Injury too was to hold him back. Like Grigg, his potential transfer value has plummeted. But the likelihood is that either Grigg or Bogle will be sold, albeit at a discounted price. Max Power was almost sold to Birmingham City in January. Although he did not have the season he would have liked, Power remains one of the more saleable assets. Sam Morsy too is a player who could be sought by Championship clubs. Goalkeeper Matt Gilks and ex-captain Craig Morgan will be two of those core members who continue. Gilks was only signed in January on an 18 month contract and Morgan recently signed a two year extension to his contract. The long-term injured players – Donervon Daniels, Reece James, Andy Kellett and Shaun MacDonald – will also be staying. Alex Gilbey is another who has not been able to play in recent games after coming back from long-term injury. Latics will be hoping at least some of those players will be available for the beginning of next season. It is difficult to predict who else will stay to provide a core for the coming season. The club is going to have to slash its wage bill some 60-70% to be financially viable. Put simply more than half of the players currently under contract are likely to depart over summer, many on free transfers. Others will be sent off on loan. Full Backs – Luke Burke, Reece James. Centre backs: Dan Burn, Jake Buxton, Donervon Daniels, Jack Hendry, Craig Morgan. Midfielders: Jack Byrne, Alex Gilbey, Andy Kellett, Josh Laurent, Shaun MacDonald, Sam Morsy, Max Power, Danny Whitehead. Forwards: Nathan Byrne, Omar Bogle, Ryan Colclough, Will Grigg, Michael Jacobs, Mikael Mandron, Sanmi Odelusi, Nick Powell, Kaiyne Woolery. The amount of turnover at the end of the 2015 season was remarkable, with 31 incomings and 44 outgoings, including loan players. Latics currently have seven whose contracts are due to expire – Jordan Flores, Jussi Jaaskelainen, Billy Mckay, Gabriel Obertan, David Perkins, Andrew Taylor and Stephen Warnock. There are another eight players whose loans are coming to an end. In 2015 Gary Caldwell had already been installed as manager to oversee the massive turnover that took place over the summer. At this stage we do not know who the next manager is going to be and there have been mutterings about taking the time to choose the right man for the job. But given a mountain of a task ahead we might well see an appointment made sooner rather than later. ← A Director of Football for Wigan Athletic?